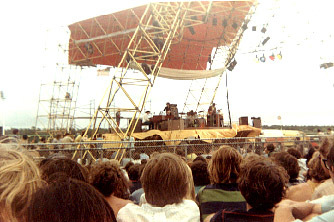 One week before Woodstock, there was a three day concert at the Atlantic City Racetrack. Thirty or so bands played, and many went on to Woodstock. There were 125,000 people there and it rained throughout most of the weekend. After the concert my group of soaked campers (aged 16-17) discussed traveling north to Woodstock or going home. After checking the upcoming weather we went home. I recently went looking through my life's treasures and found a set of photos from the concert. Procol Harum has ALWAYS been very dear to my heart so, of course, I took a shot of them. I sent a copy to Ed Randy Barnett who urged me to send this to you. I too am a musician and songwriter and produced his recent CD, I'll Get Back To You. We have been close friends since 1970 when we were college roomates. Imagine our surprise when we pulled out matching Procol Harum collections!